So last weekend I attended the 2012 Melbourne Bachata Festival – Victorian Bachata Competition, in support of my friend Natalie Montano of Synergy Salsa and to lend a screaming voice to all our Melbourne Dance Hub competitors. It was a pleasure to be a spectator and not be in the performance or judging mix this year. To me, humbly speaking, this is what I say to my students all the time – to really explore the essence of Bachata you must first get into the “Spirit” of Bachata. Bachata to me is that blissful moment before a “first kiss”. It’s that feeling that sits between love and lust. It’s that true connection devoid of glitz – just pure ‘raw’ energy only relying on the dancer’s expression to supply that true glow. That glow to me is what makes a true Bachata routine. With all due respect, I’m not impressed by triple turns into a deep back bend when you’re basic step is soul-less. Your Swarovski crystals ain’t gonna cut it if your embrace feels false. I feel that true Bachata speaks for itself – you can’t fake it. Your jazzy smile and shiny costume is not a big enough smoke screen to true Bachata lovers. You want us to keep watching you? Then you better show us the real YOU. You do that and you will shine. On the night, I was very impressed with the level of choreography and skill compared to last year’s competition. In general the talent was very encouraging and it seems that Melbourne has really embraced Bachata as an artistic form of dance expression. Congratulations to our very own Gabriel Urrutia and Javiera Solar who won the Amateur Division with an impressively intimate routine that scored the highest overall – and more impressivley ended with a kiss. Our resident Pro-Am couple Ernie Diaz and Meghan Sinnott took out the division with another high level performance filled with expressive choreography and impressive technique. Our team coaches Nathan Thorneycroft and Brooke Gittings debuted their Spark team to rave reviews with a very polished and high energy routine. So needless to say, last Saturday night was a massive night for our humble studio. 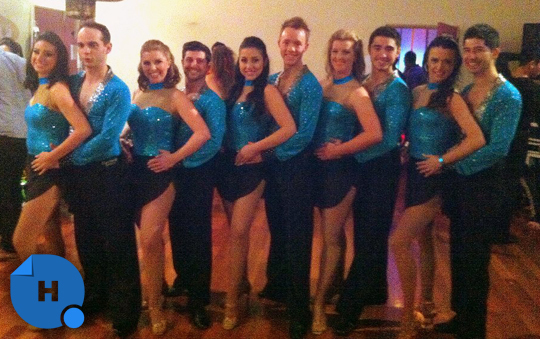 This weekend Spark is performing at the 1st Annual Canberra Latin Festival. Watch out for this amazing up-and-coming troop. They are a real reflection of their directors Nathan and Brooke – creative, energetic, and innovative. Spark dancers: Amelia Russo, Geordie Mitchell, Javiera Solar, Gabriel Urrutia, Jason Smith, Rachel Cayley, Ernie Diaz, and Meghan Sinnott. Directors: Nathan Thorneycroft and Brooke Gittings. The Hub has some great bachateros!!!! !